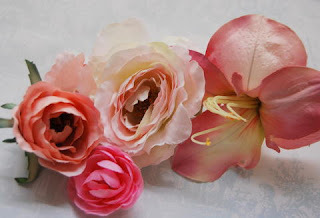 We have the most divine collection of hand made flowers on hair clips ready to go and here I have photographed some of the range so you can see how beautiful they are. Most of these are exclusively available to us as we have them hand made to our specifications in Europe. Our flowers are hand made from the finest silk ,velvet and silk organza we have a section in our brand new site where we are currently loading some of the collection but if there is a colour you are particularly looking for email us at juliefleming@bigpond.com and we will have a look for the colour for you. Usually I hand make the details and thought you might like to see the gradual build up to the finished product. I often use swarovski crystail detail in my work as it adds the 'hollywood glamour' edge to any piece. I have added some recent examples including a floral -tie-belt and a couple of green and cream headbands. I often have to make to order various hair clips in different colours when a client orders and here are some examples of the different colour ways I have made over the past day or so. I Love the original in soft cream and pink however the white version which is for a bride is so pristine (also love the red version for the drama) - these clips are my latest design using flowers that are made for me in Europe and evoke another era. My work is often vintage inspired and here is the 1940's !! Usually I hand make the details and thought you might like to see the gradual build up to the finished product. Laura wearing our Ivory Marabou Capelette - Laura sent me these pictures and I think she looks gorgeous (and warm) in her stole, Laura wrote : 'I had so many compliments on the stole - everyone thought it really worked with the winter wedding theme, as well as keeping me warm (it was minus 2 on the day!) ' You can see more pictures of this stole and others on my website. This is Sophie's wedding I handmade her little hair clip with feathers and her bridesmaids all had similar hairclips except theirs were cream and pale blue. 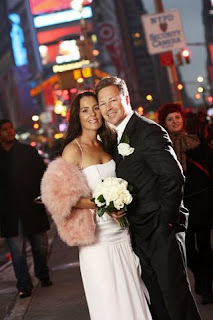 Occasionally we are asked to make to order a Marabou stole to complement a bridal dress - also have made marabou muff to match as well and here they are - the pink on the streets of New York !